Sometimes you hear about a place and don’t really bother to look up any information about it, because there is another place nearby that has an amazing reputation. This was the case when we first heard about Le Taha’a. We just saw it as a layover between our stays in Moorea and Bora Bora. In hindsight we are so ashamed that we even thought about skipping Le Taha’a and staying a few extra days in Bora Bora. We are so glad that we didn’t because even though most of the resorts and hotels in French Polynesia claim that they are ‘the hidden pearl of French Polynesia’, the Le Taha’a Island Resort & Spa exceeded all of our expectations and blew our minds, according to us this is the real hidden pearl of French Polynesia. 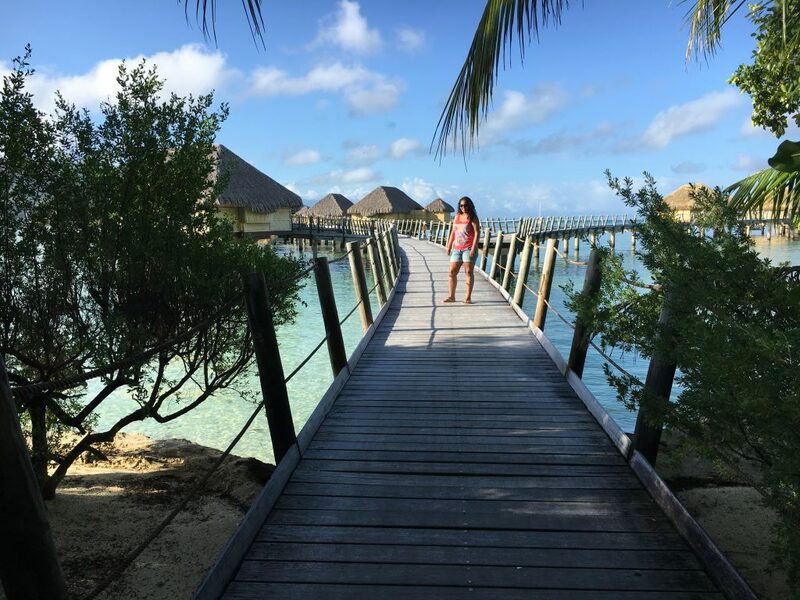 Boardwalk to the overwater bungalows at le Taha’a island resort and spa. The Island of Taha’a shares the same lagoon as the island of Raiatea (where the airport is located). 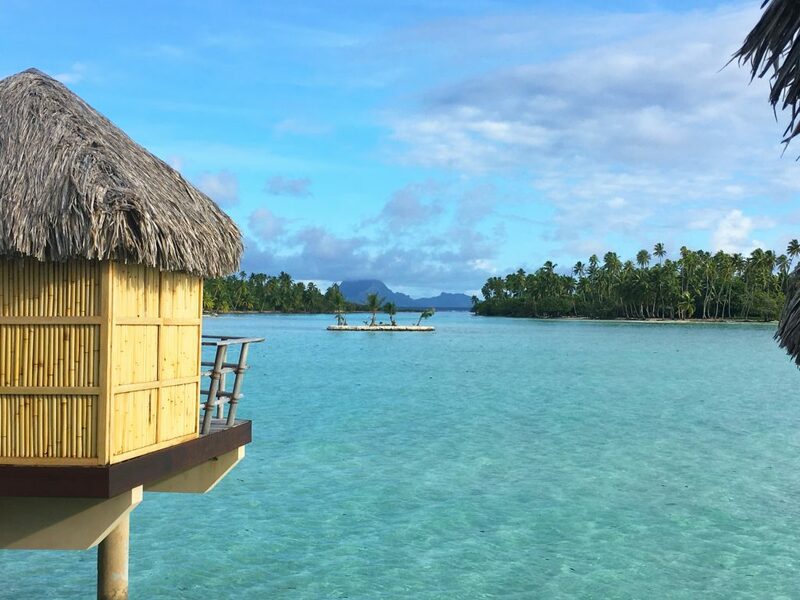 The resort, which opened in July 2002 faces the lush island of Taha’a on one side and the amazing silhouette of Bora Bora on the other side. 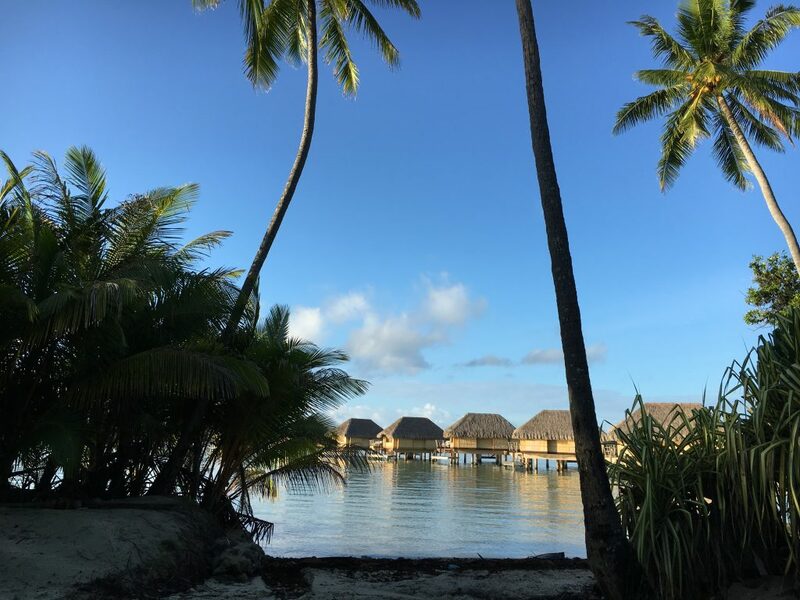 The entire style of the resort is inspired by traditional Polynesian architecture and provide you with the perfect blend of both culture and luxury. It’s the perfect getaway for a honeymoon or a relaxing vacation. We arrived at le Taha’a, not knowing what to expect. The island and resort were gorgeous (even in the rain) and the welcoming smile of the general manager and his staff made us feel right at home. The bad weather was soon forgotten. We have travelled to so many countries and so many different hotels but when we think back most of the times we didn’t even see the hotel manager, let alone having him welcome you. We found this to be a big plus and just shows that le Taha’a is all about customer service. 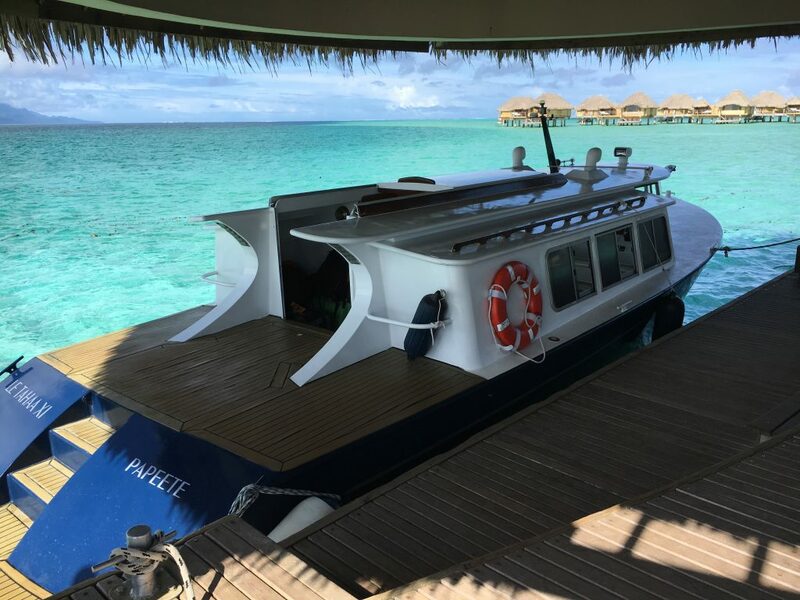 Le Taha’a resort and spa boat shuttle. 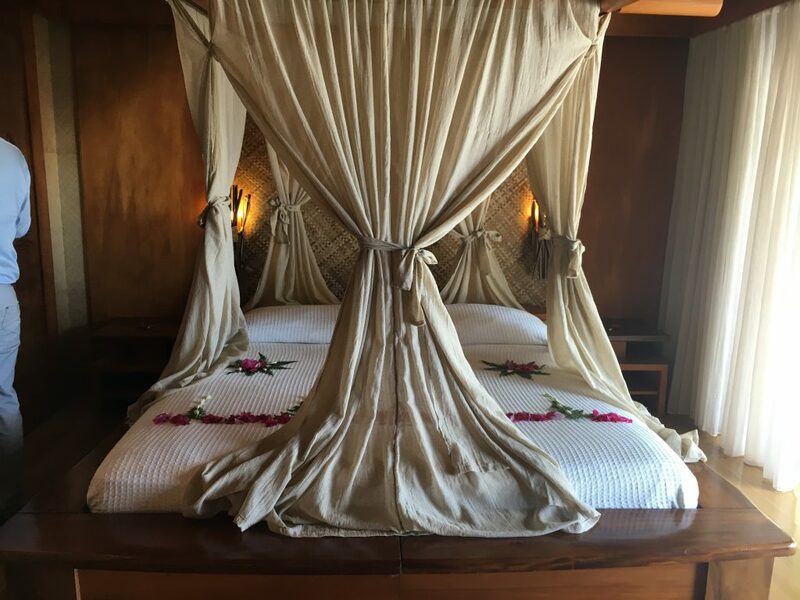 At the Le Taha’a Island Resort & Spa we stayed in our of their amazing overwater suites. Once we opened the door we gasped, it was one of the most beautiful rooms we had ever seen. The room was beautifully decorated for us with flowers everywhere and there was a bottle of champagne waiting for us and a plate of delicious treats! There was a huge bed, a little couch that could be turned into a bed (child friendly) and a beautiful bathroom with both a bathtub and a shower. There was a big outdoor deck with two lounge chairs and a little sitting area which had a little roof so you could sit in the shade. The resort offered a turndown service. Every night when we went out to dinner, housekeeping came and tidied our room, made our beds and even left some complimentary water. Just one of those little things that made our stay here feel so incredibly luxurious. 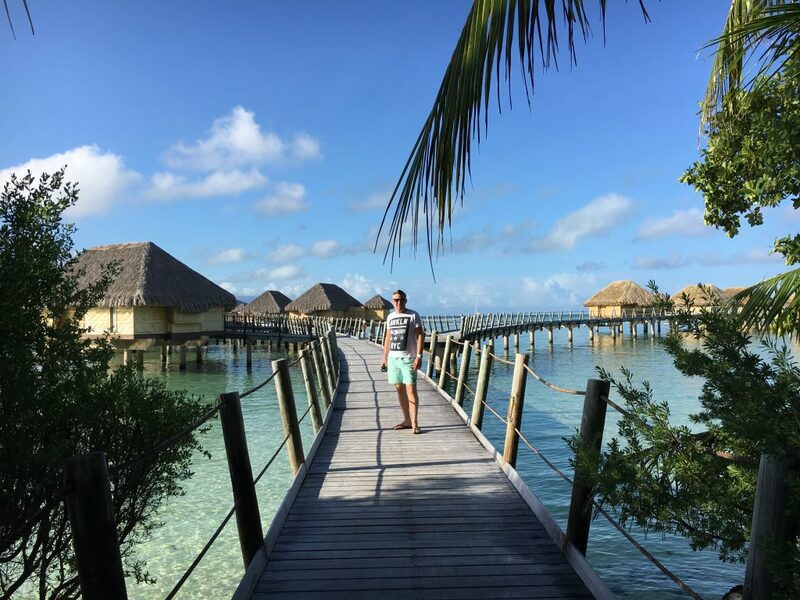 Overwater bungalows at le Taha’a island resort and spa. We were lucky enough to get a little tour around the resort by the general manager himself, Julien. During the tour he told us a lot about the resort and the history of it. Most of the material used on the resort to build with, are natural materials. This means that because of the damage that the salty water causes, things like the overwater suites need to be renovated every 18 months. Also the gardens on the resort have a lot of Tamanu trees, which is considered the most sacred tree in French Polynesia. They extract oil from the Tamanu fruits which has all sorts of health benefits. After our stroll through the gardens, we got a chance to look at some of the other rooms as well. Overwater suites with Bora Bora view. We got to see the Bora Bora overwater suites. 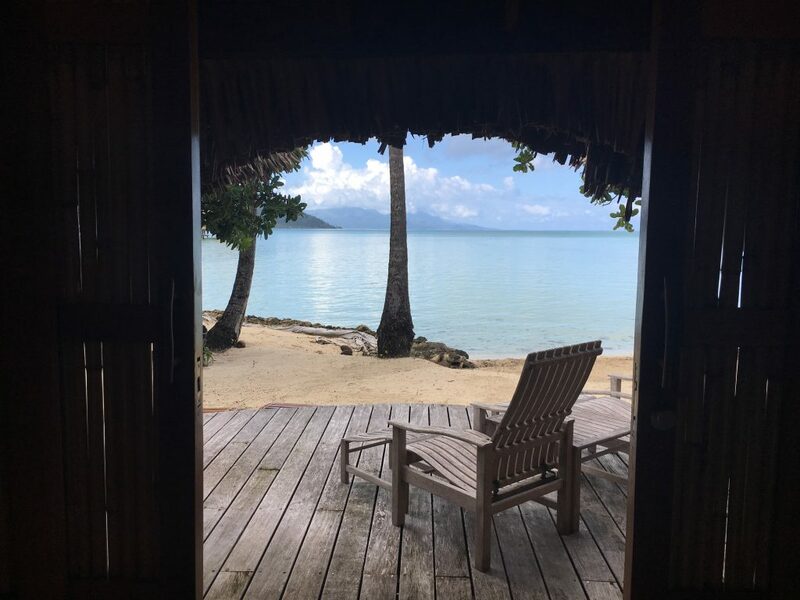 These bungalows were the same as ours, but they had a view of Bora Bora. They also offer sunset overwater suites (with an amazing view of the sunset) and end of pontoon overwater suites which offer more privacy and a great view of the sunrise. We also got a tour at the beach villas and Royal beach villas which are considered to be the resorts’ signature accommodation. The beach villas are located right at the beach and even have their own plunge pool. Ideal if you are travelling with (small) children and you don’t want to leave the comfort of your own villa. Besides having a spacious living room and a complete bathroom, these villas also come with their own outside bathtub and shower. Ideal if you want to enjoy the starry Tahitian skies. Royal beach villa beach deck. Royal beach villa terrace and pool. The Royal beach villas are similar to the regular beach villas but much bigger to accommodate 5 persons. Perfect for families or friends who want to stay close to each other. 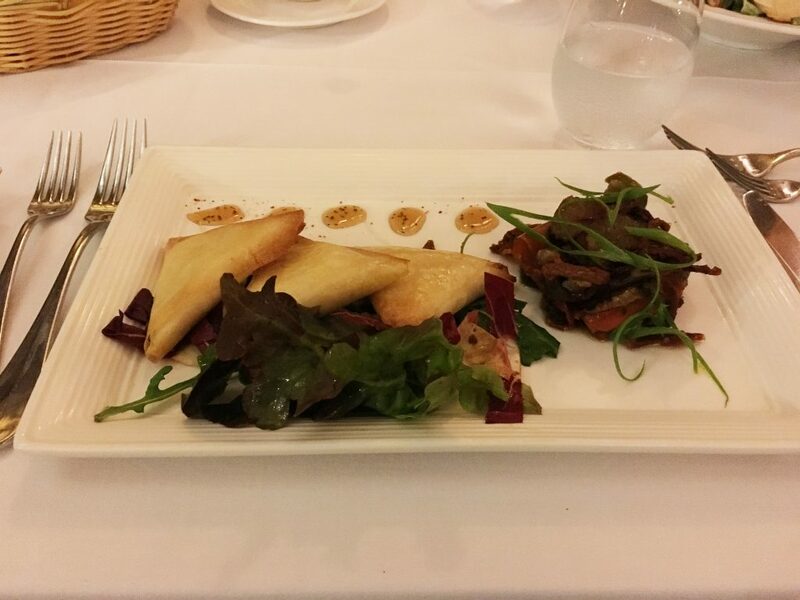 At le Taha’a we had also chosen for a meal plan. 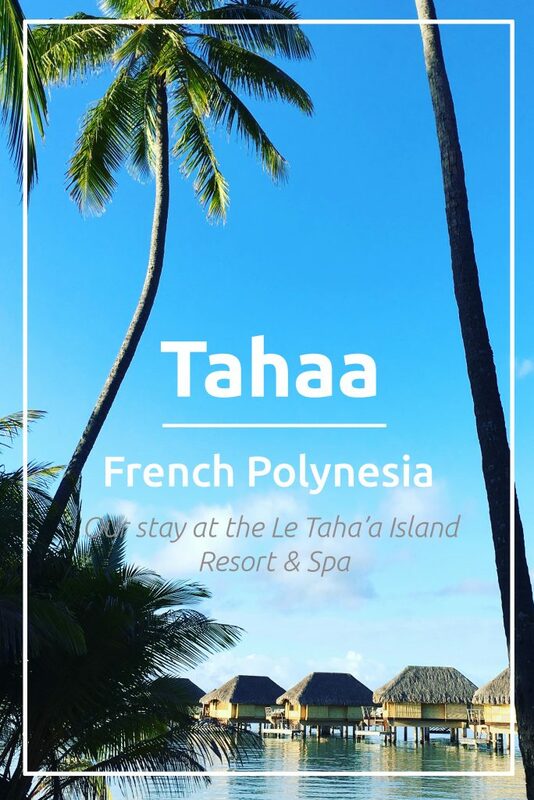 Other than the other hotels we stayed at in French Polynesia, le Taha’a offered a 3 course meal plan instead of 2 courses and the big plus that all the dishes were included in your meal plan. 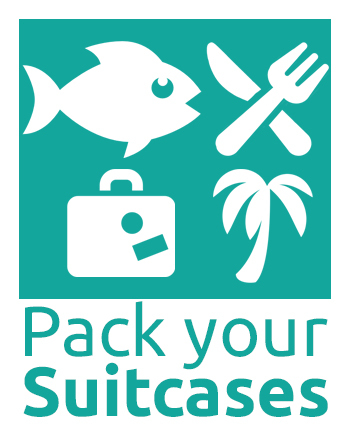 You didn’t have to pay extra for some of the dishes like we had to in our hotels in Moorea and Bora Bora. We thought this was a bit frustrating since you had already paid for your meal plan. Also now we didn’t have to choose between a starter or a dessert. Dinner/meal plan at le Taha’a island resort and spa. The meals at Le Taha’a were some of the best we’ve had in French Polynesia. Everything was absolutely perfect, from the selection (they had so many amazing dishes to choose from) to the cleaning of the table cloth by the waiters in between the main course and the dessert. Everything felt just perfect and very luxurious. Some nights they even had a traditional Polynesian group of musicians preform cultural music adding to that French Polynesia atmosphere. The breakfast was outstanding as well, so many delicious choices! They had a cute restaurant at the pool that served a great lunch too. The resort had a lot of places where you could lie on the beach. Therefore it never felt crowded and sometimes you had the feeling there was almost nobody there. There were plenty of sunbeds and lots of kayaks/paddle boards which you could use free of charge. Beach at le Taha’a island resort and spa. One of the things we liked the most about this resort is that they have an amazing reef where you can snorkel not too far from the beach. Snorkeling is one of our favorite things to do, so we’ve spend a lot of time underwater. We saw so many colorful fish and even a big stingray. The pool was good but not that big. This wasn’t a big disappointed because we prefer swimming in the sea rather than in a pool. We also used the gym. The gym is a decent size and had more equipment than we thought it would have. The Spa was extraordinary. We were lucky to have a full body massage. When you go to the Spa, you are first welcomed with a delicious vanilla drink. You’ll get to choose a scent of monoi oil for your massage (flowers, coconut, vanilla, grapefruit. They make their own oil for the Spa and they sell it in their boutique, so you can recreate your Polynesian massage at home. The massage was wonderful and we both almost fell asleep. 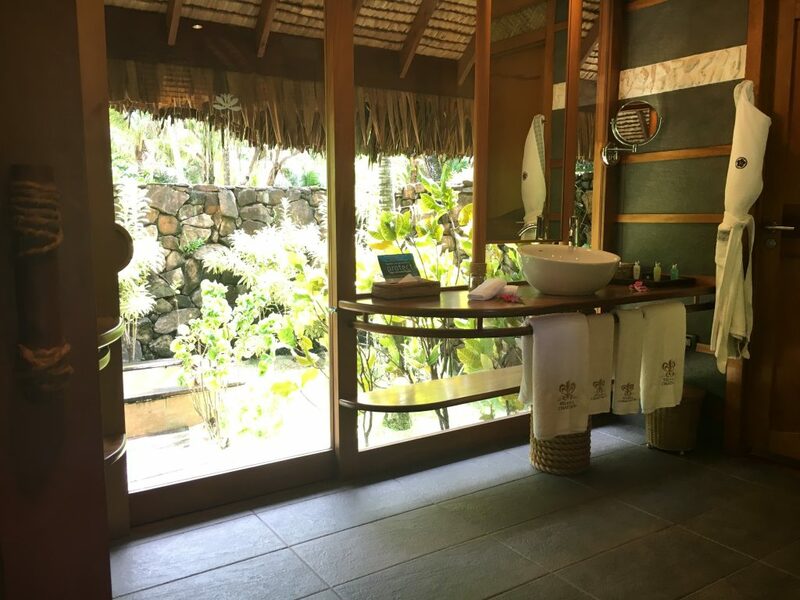 A visit to the spa is a must do at this resort. We can understand that for some people the small size of the general pool can be a big dislike. It could have been a little bigger. 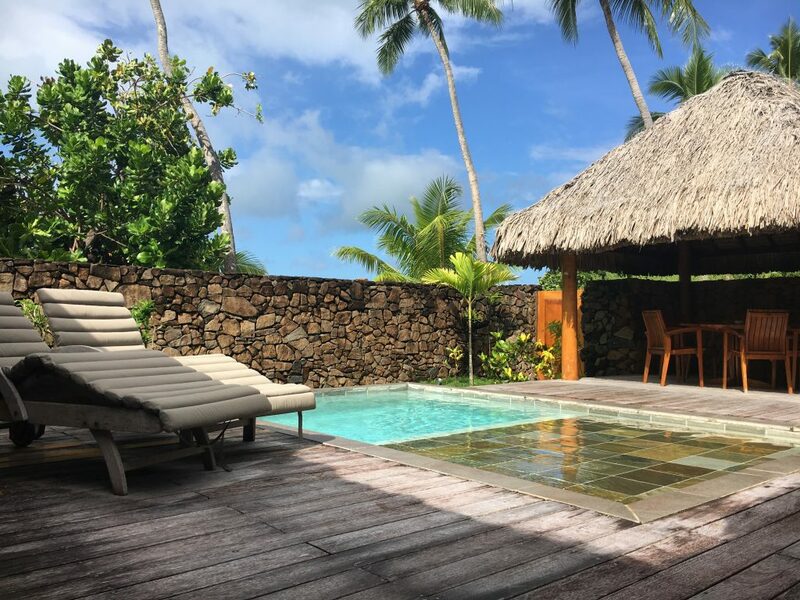 Le Taha’a Island Resort & Spa is the epitome of luxury and tradition. We are so glad that we got to discover this amazing resort. Our only regret is that we dindn’t stay longer. If you are planning a trip to French Polynesia, don’t forget this resort. 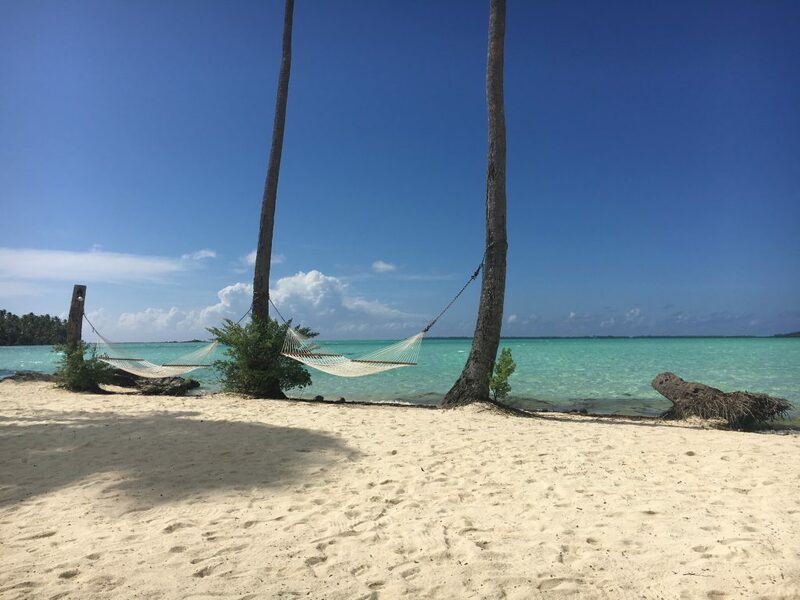 It’s perfect for childeren and families but also for honeymooners who are looking for the ultimate Polynesian experience whitout sacrificing the luxury.